Hi you all! I've been wondering for a while: do you ever post Work in Progress-pics anywhere? I love to see other peoples wip-photos, and pics of workspaces etc. Off course I'm totally inspired by all the finished bears, but I also get very inspired by watching unfinished work, seeing how people work, and how they organise stuff. Am I the only one? Do you ever post wip on blogs or other places? 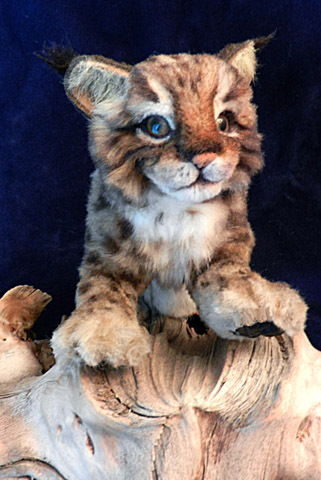 I just finished a series on my Facebook Page, KJ Lyons Design, showing images from each step I took while creating a Bobcat kitten. It was my first new design for 2013. I really enjoyed the whole process! Because I knew people were waiting for the next step in the design I found myself staying on schedule so they would not be disappointed I, also, had to be able to explain each step so it gave me a better understanding of how I work and how I might improve. I had hoped for more questions or suggestions, but people were very kind and, generally, had only encouraging comments. For some reason there seems to be a lot of interest. Because I can see the stats of how many people are viewing at your photo's. I posted one photo of part 4 this afternoon and it already was viewed 207 times!!!!!!!!!!!!!!!!! Quite a lot I think! So keep them rolling those WIPS...........I love it!!!!!!!!! Thank you, all! I just had a great time watching all of your links! It is so educational to see and read about how you work. I learned a lot by seeing your pages and blogs. I will continue to follow them You all do amazing works! I always find very interesting to read about work in progress and to see pictures of it. We have all developed our own way to develop a project...the 'behind the scenes' is always fascinating! I have been updating and restyling my blog lately. 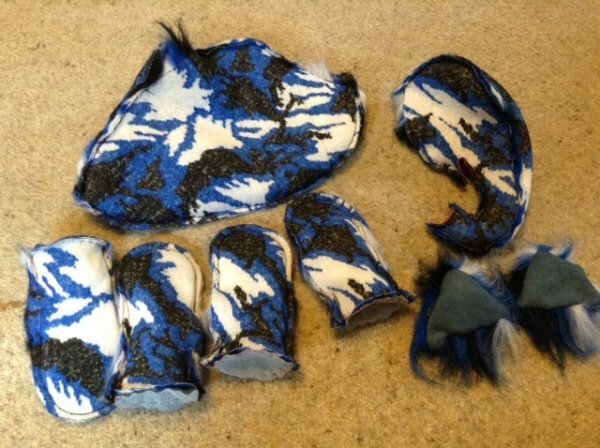 I also often post pictures of my work in progress, and I have added several sections, one with pictures of my workspace. It has been hard work....but I enjoyed it very much! Francesca, what a wonderful blog! Thank you Karen and Boop! I'm having real fun with the blog. My workspace looks clean because I cleaned it before doing the pictures.... It can be really really messy when I'm in the middle of a project! Wow, Katy! That was a lot of good reading! I started reading before leaving for work today, and could hardly wait to get home and continue reading. 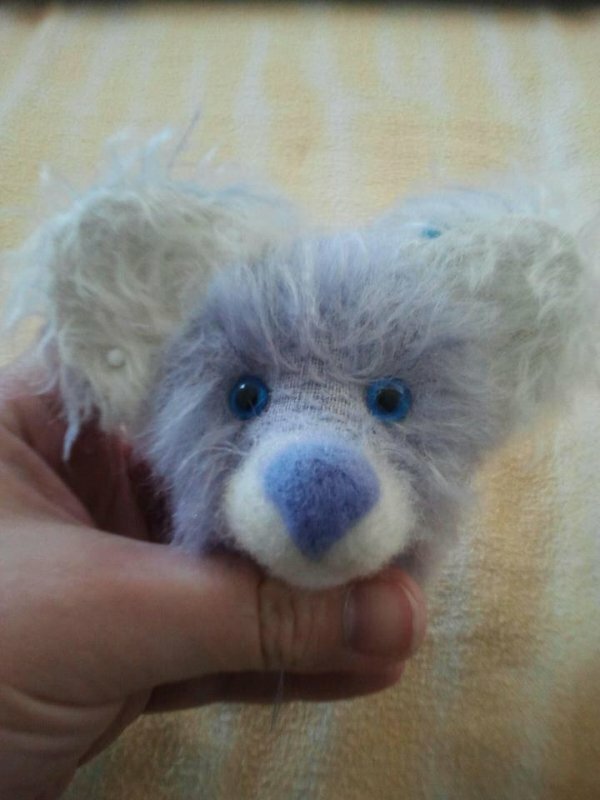 I haven't made any bigger bears yet - just miniatures, but after reading your blog, I would really like to try. I learned so much! Thank you for taking the time to make these posts. 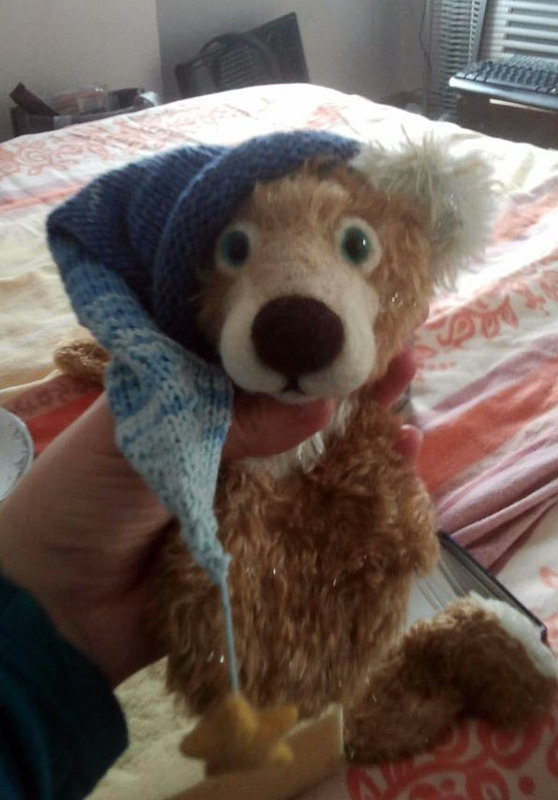 Your bear turned out super cute! Glad you liked it, although I probably have about 50 zillion extra steps in there than the good guys It really was just how I do it rather than how anyone else had to, but it was to show my sewing friends what was involved in making one, as, coincidentally, it was being made for another sewing friend, and a number of them had met some of my guys that I'd taken to an event last summer. I like to post WIPs. I do it mostly on my personal facebook for now. Once I finally have a "business name" settled and have more than one bear to my name I'll make a FB for the bears. Anyway, here's the face of my newest little lady. I am so pleased that the nose came out just how I wanted because this is my first pattern I drew myself! Thank you, Boop! I like how she's coming out, too. I was originally going to give her an open mouth like my first bear (just smaller) but she wound up with this adorable underbite and I decided to keep it. 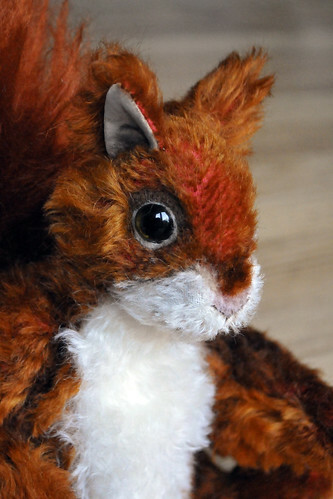 I just have to decide whether I want to embroider or needle felt her smile and finish needle felting her paw pads and she'll be ready to put together and put on her "make up." I think my favorite part is drawing on the shading. I love your bunny in your first post! That body shape is my favorite. Vicki, that bear looks gorgeous! So soft and pretty! Thanks for showing us the wip. It must be really hard sewing in real fur. 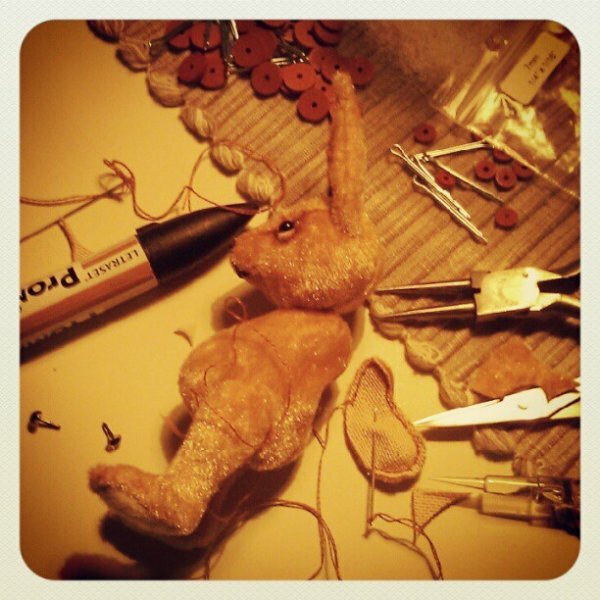 I started a miniature in real leather last week, but my fingers hurt just after sewing the head together. Oh my gosh, that mink bear is GORGEOUS! I've got a new WIP to show. I am still hoping to make it for the NTBAA... but I've been very sick (almost hospitalized, yikes!) and it's kind of looking doubtful... I'm trying to work on him today but I am on steroids which are making my hands shake. He's coming along slowly but he's coming along. I am hoping for sleepy, droopy eyes and a big goofy grin. A lot more needle felting on this guy. 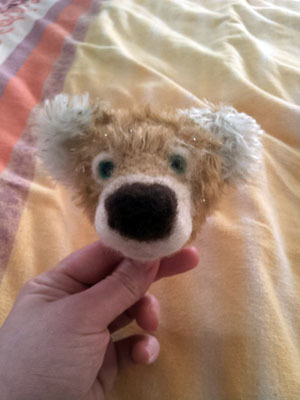 He'll have a big face since he's the "All the same pattern" bear and I couldn't cut down his nose to accommodate the extra needle felting. I kind of like that look for him though so I think it works. I want him to be a cartoony, friendly guy. I am going to needle felt him a little smiling cloud to be his buddy and to rest his weary head on. I like the 'sneak peek' feel of these posts and don't mind showing my work halfway though... I like seeing other peoples work this way too! Hey, Chloe . . . good to see you on Teddy Talk! Give us a visit more often! Thanks Sue Ann, it's good to have a bit of guilty bear making time I don't get much now that I'm teaching full time, so I'm glad to see some familiar faces! I was so impressed I had to Like your FB page- amazing work! Hubie's nearing the finish line. It has been like four years since I last knitted. ;. ; I'm blending some of his brown body fur into his (white) paw pads then I'll be attaching and doing the finishing touches. Hoping to finish him tonight or tomorrow!